The Library is located in the former Methodist Church, a building with a rich history. 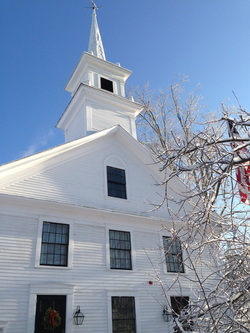 The Methodist Church was originally constructed in 1859 on land conveyed to several Brookline citizens. This land had the strict condition that it be occupied for the purposes of a "House of Worship for the Methodist Episcopal Church." According to the deed, if the land ever ceased to be used for that purpose, the land would revert to the original owner, Joseph C. Tucker. The building was used as a Methodist Church until 1951. At that time, two of the town churches merged. For the next 40 years, it functioned as an activity center for both the town and church youth groups. Then, the Church of Christ and the Town of Brookline decided to expand their facilities. The Church was left with a mortgage and the Brookline Library needed to move out of Town Hall. Fortunately, a solution was found that satisfied both groups. In 1992, the Town voted to purchase the building, which housed the Youth Center, from the Church for approximately $25,000 to renovate it as a Town Library. Meanwhile, the Church was able to complete their new three-story addition using the proceeds from the sale. Before the transfer of the property and funds could be accomplished, however, there was a significant obstacle to overcome. The Methodist building had not been used as a house of worship "and for no other purpose" for some time as the deed had stated. It was necessary to have the heirs of Joseph C. Tucker release any interest in the property to provide the town with a clear title. Armed with only a deed and probate records of Joseph C. Tucker, resident Midge Chandler and Library Trustee Ellen deGuzman began the extensive searches for any heirs of Mr. Tucker. To everyone's relief, there was only one heir, 74-year-old Lionel Weatherall of Munsey Park, New York. On August 24, 1992, 133 years after the original conveyance, Mr. Weatherall, as the sole living heir of Joseph C. Tucker, graciously released his interest in the property so that the Library could move in. The former youth center was extensively renovated in the fall of 1992 and was ready for occupancy by January, 1993. In 1992, the Friends of the Library re-formed after a three-year hiatus and were instrumental in providing funds, labor, and support during the move.